Businesses exist to solve their client's problems. Building a profitable one starts with getting clear on who your ideal clients are what problems you will help them solve. You can have the best solution, but if you're the worlds best-kept secret, you do your potential clients a disservice and end up having an expensive hobby instead of a profitable business. Once you get clear on your ideal clients, and their problems, position yourself so that those clients find you. That's what today's episode is about. We look at how to build our audience so we can effectively serve them. One way to do this is by creating valuable content, also known as blogging. 1. Blog and repurpose your content into formats your ideal clients consume. 2. Make it easy for your audience to help you go viral with share buttons. 3. Not all Social Media platforms are created equal, be strategic. 4. Collaborate and network with your niche peers, it's a win-win. 5. Beyond the lead magnets and opt-ins, conversion strategies. Ready to up your content game beyond the 5 tips and freebies? 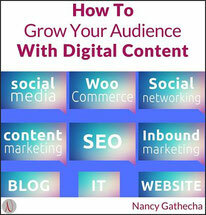 Today's strategies are part of my resource with 52 powerful, proven strategies to grow your audience online. You'll be covered for a full year, with simple, but proven and effective strategies you can implement every week. No more wasting time googling how to grow your audience. I've done all the hard work for you. 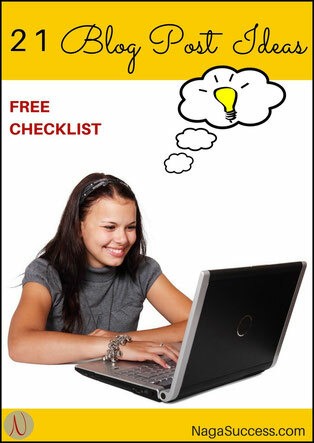 Free Checklist - 21 Blogging Ideas.